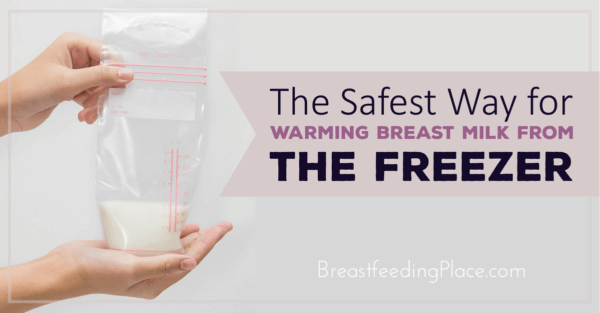 Whether you pump exclusively or are an occasional pumper, if you store your breast milk in the freezer you need to know how to warm it up before you give it to your baby. Remember, when you breastfeed your baby, the milk is the same temperature as your body, so your baby may refuse bottled breast milk if it is too cold. On the other hand, you want to make sure the breast milk isn’t too hot or you could harm your baby. Warming breast milk from the freezer is a pretty straight forward process. First, let’s take a minute to review proper breast milk storage in the freezer. When you finish pumping, transfer the breast milk to a freezer safe storage bottle, or a plastic bottle liner bag made especially for breast milk. Make sure you leave an inch of space at the top of the container because the milk will expand when frozen. It’s best to freeze breast milk in 2-4 oz. quantities for easy thawing. Seal the bottle or bag and label with date and time. Breast milk can be frozen for 4-6 months. Place in the back of the freezer, not the door. You want the milk in the coldest part of your freezer. If using bags, lay them down flat for easy freezing. First, you need to thaw the breast milk. If you plan ahead, place the frozen bottle or bag in the refrigerator 24 hours before you are going to use it. If you need the milk immediately, run the bottle or bag under warm water until it is thawed. You are also going to warm the milk under warm running water to bring the temperature up. You could also place the bottle or bag in a bowl of warm water for a few minutes. Swirl the warmed water until the milk is all combined if it has separated and transfer to your baby’s bottle. Don’t forget to test a drop or two of the breast milk on your wrist to check the temperature. DO NOT warm or thaw breast milk in the microwave. The microwave may get your milk entirely too hot which will not only burn your baby, but also destroy important enzymes in the breast milk. DO NOT refreeze breast milk. Once you thaw it, use it within 24 hours. 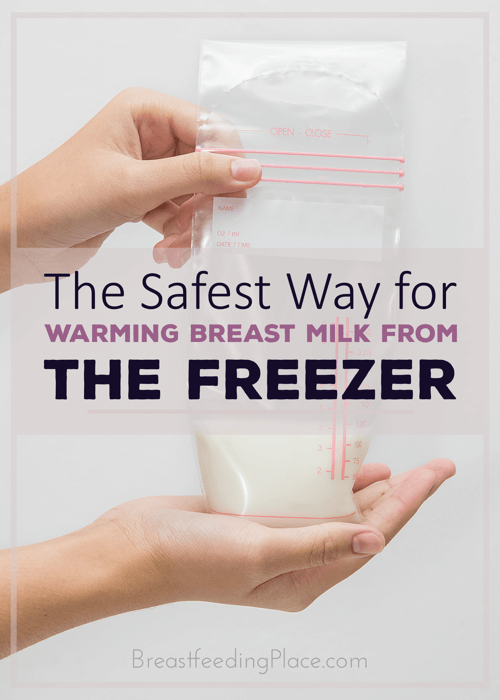 With a little practice, you’ll be a pro at warming breast milk from the freezer and you’ll be able to get the temperature just right for your baby!